Our family had a unique encounter with a wild dolphin. The dolphin stayed with us as we swam for a full hour, and would have probably stayed longer had we not got out of the water. Our friend, Dave Houston, said that in all his years’ of sailing he has not seen a prolonged interaction like we experienced with our dolphin. My husband, Rick, was the first person to spot the dolphin. He assured us that it was a dolphin, and said that he had seen its bottle nose head. Here is a picture of Rick in the water with the dolphin. Rick approaches the dolphin. At this point, we were pretty sure it wasn’t a shark. Here is roughly what was going through my mind as we watched this initial encounter. Soon, we all took turns swimming or watching the dolphin in the water. Here is Karen (age 4) as she watches the dolphin underwater. The dolphin seemed just as interested in us as we were with the dolphin. At one point, Karen and the dolphin seemed to be locked in a gaze. We were glad to share this experience with our friends, Dave and Nathalie Houston (SV Cheval). Nathalie filmed the dolphin. 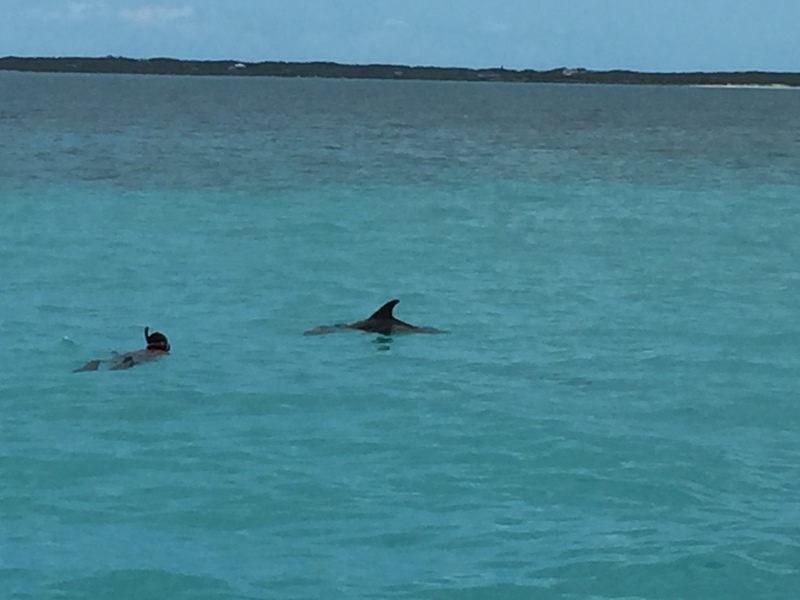 Here is a video of the dolphin and 10-year old, Betty. Rick created the video using Nathalie’s original raw footage. We have been playing with the iMovie application and while I will continue to be writing, we hope to post more videos in future. Wow, what a great encounter! Hi Lauraine, I love this! The dolphin looks like he’s smiling:) Amazing and wonderful to see no fear between Betty and the dolphin. There are lots of reports of dolphins swimming with people to ward away sharks. If you google Dolphins protecting swimmers you’ll find lots. Just a thought. Very cool. I hope my birthday message reaches you. I am trying to send it through the blog.